Junior HRD Minister Dr. Satya Pal Singh cautioned educational administrators that autonomy for institutions comes with accountability and they must use the powers to build institution of quality. Giving his Chief Guest address at 23rd Prof. Ram Reddy Memorial Lecture at Indira Gandhi National Open University (IGNOU) today at IGNOU Campus, Maidan Garhi, he asked why is it necessary for any research done in India to have a stamp from some western journal or institute even now. Dr. Singh also said that the process for the new Higher Education Commission has been initiated and the suggestions being sought from all the stakeholders. The minister was talking about the recent Human Resource Development (HRD) draft regulation to repeal UGC Act, 1951 and to replace it with a Higher Education Commission of India (HECI). Emphasizing that the new education policy should focus on holistic-development and try to inculcate the right value-system in the learners, he urged IGNOU to have course content which helps imbibe those values in the learners for society building. He also took dig at those who would pursue doctorate for earning just another degree. He questioned how many research papers have resulted in tangible benefits for the society and said that research done should be relevant and result in innovation. 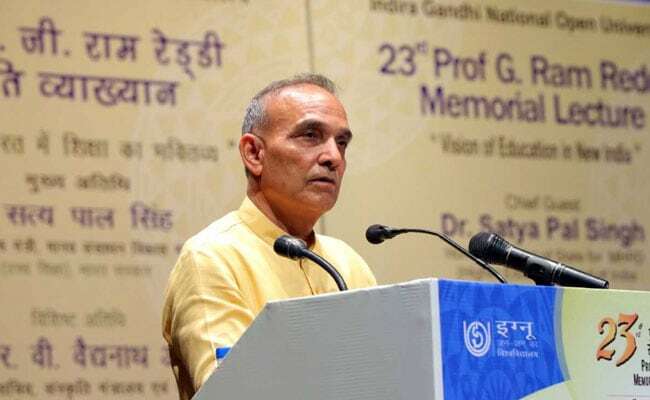 Dr. Satya Pal Singh lauded IGNOU’s contribution to higher education and said that changes are required to make education India-centric as there has been undue influence of western education system. Earlier, Prof S.B. Arora, Vice Chancellor, IGNOU in his welcome address paid homage to the founding Vice Chancellor of IGNOU , Prof G. Ram Reddy and also expressed his gratitude to Mrs. Pramila Reddy for having come for the memorial lecture. He said that IGNOU is progressing continuously in the field of tertiary education. He complimented each member of the IGNOU community who has given his/her contribution in building the institution what it is today. Shri R. V. Vaidyanathan Ayyar, Former Secretary MHRD and Ministry of Culture while remembering Prof. G. Ram Reddy’s contribution in the field of education said that Prof G Ram Reddy was Institution Builder as he was instrumental in creation of Andhra Pradesh Open University, Indira Gandhi National Open University and National Assessment and Accreditation. Talking on the theme of the lecture, “Vision of Education for New India” for the university, Shri Vaidyanathan said that while IGNOU has made great strides in open education but it is also time to reflect and retrospect for the institution.